The University of the Fraser Valley women’s rugby sevens club turned in a sixth-place finish at the Canada West Sevens Series opener in Edmonton this weekend. The Cascades posted a 2-3 record at the event. During Saturday’s pool play, they registered a win against two losses, dominating the Thompson Rivers WolfPack 42-5 to go with defeats to the Lethbridge Pronghorns (26-7) and Calgary Dinos (40-10). On Sunday, they blitzed the Regina Cougars 33-0 in their consolation-side semifinal before dropping a 29-7 decision to the host Alberta Pandas in the fifth-sixth placing game. The UBC Thunderbirds won the tourney title, edging Lethbridge 19-12 in the final. The “Big Five” Ross was referring to are Canada West’s longstanding fifteens rugby schools – UBC, Lethbridge, Calgary, UVic and Alberta. The Cascades fared well against the newer sevens-only programs (TRU and Regina), but have yet to break through against the other five. Rookies Sophia Belsher and Melissa Jongedijk tied for team-high honours with five tries apiece over the course of the tournament. Elyssa Chalmers scored three tries, and Shalaya Valenzuela and Mackenzie Fowler had one each. Fowler added 12 converts for the Cascades. The second leg of the Canada West Women’s Rugby Sevens Series will be hosted by the Cascades at MRC Sports Complex, Feb. 2-3. For the second straight day, the University of the Fraser Valley women’s volleyball team polished off the College of the Rockies Avalanche in three sets at the Envision Financial Athletic Centre. The Cascades, coming off a straight-sets triumph on Saturday evening, reprised that feat in a rare 11 a.m. Sunday morning start. 🏔🏐 WVB RECAP | The Cascades wrapped up a weekend sweep of the College of the Rockies, prevailing in three straight sets! Chelsea Kidd came off the bench to pace a balanced UFV attack with 11 kills, as the CCAA No. 9-ranked hosts improved to 11-5 in PACWEST play, good for third in the conference. Fifth-place COTR fell to 4-14. “We were balanced,” he said. “It’s so hard for them to key on any one person. The Cascades continued their hot play from the night before as they leaped out to leads of 10-5 and 18-10 in the first set, before closing it out 25-12. The second set saw the two teams trading blows early on, but strong attacking play from Lauren Poirier in the middle allowed the Cascades to pull away and take it 25-18. The momentum stayed with UFV in the third set, allowing them to grab a 15-8 lead over the visitors. Kidd spearheaded the offence, and the hosts closed out the match 25-17. Kidd’s team-high 11 kills came on just 19 swings for a .526 hitting percentage. Left sides Kim Bauder and Amanda Matsui connected on seven kills apiece, right side Keira Fisher posted six kills, and middles Poirier and Hanna Hieltjes had five apiece. Stephanie Demeules got the start at libero and racked up 15 digs, and Bauder had 12 digs. Gilray was pleased that middles Poirier, Hieltjes and Alysha Cooper all got extensive playing time on the weekend and played well. The Cascades volleyball teams hit the road next weekend to face the Vancouver Island University Mariners in Nanaimo. The University of the Fraser Valley men’s volleyball team fell in four sets to the College of the Rockies Avalanche on Sunday afternoon at the Envision Financial Athletic Centre. 🏔🏐 MVB RECAP | The Cascades had their chances, but the COTR Avalanche fended them off in four sets this afternoon. The Avalanche continued their momentum from Saturday’s three-set triumph, as they grabbed an 18-10 lead in the first set, and held on to take it 25-19. The two teams played a tightly contested second set, but with the score tied at 22-22, Adam Frederickson went on a service run for the Cascades to give them the 25-22 win. COTR took a 17-12 lead in the third, before UFV’s Andy Barrero went on a four-point serving run to even the score at 17-17. The Cascades had a chance at set point, leading 24-23, however they were unable to capitalize and left the door open for the visitors to take it 27-25. The Avalanche carried that momentum into the fourth set, as they took leads of 13-10 and 20-15, before closing it out 25-19. The Avalanche improved to 8-10, while the Cascades slipped to 1-15. “We just gave up runs at the wrong times, again,” Cascades head coach Kyle Donen said. “I thought we contained it a little bit better today than yesterday, but we were up 22-20 in that third set, so we were in the driver’s seat to take it. Unfortunately the two points that beat us at the end were a ball off the tape and a ball that tagged the back line. It’s a game of inches, and it was that close for it to be a bit of a different game. Cascades captain Ben Friesen had a team-high 11 kills. Barrero followed with six kills of his own, while Jackson Obst and Josh Fefchak each had five. Caleb Peters and Gustavo Bertoli tied for game-high honours with 15 kills apiece for the Avalanche. The Cascades volleyball teams hit the road next weekend for a Friday-Saturday set vs. the Vancouver Island University Mariners in Nanaimo. 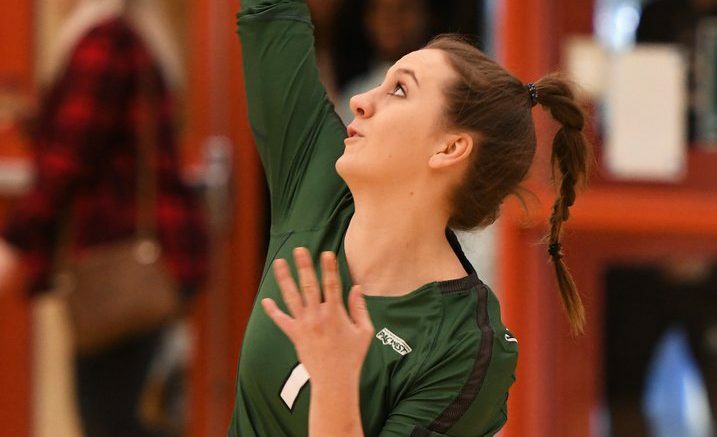 Be the first to comment on "UFV Sports Sunday – Women’s Volleyball Sweep Avalanche, Rugby"